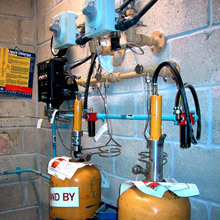 This ChlorGuard assembly offers a very robust solution for Emergency Valve Shutdown installations. 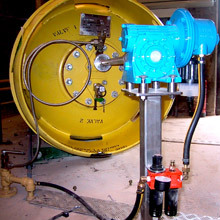 The bespoke reduction gear drive enables the system to close off a variety of different torqued valves from soft seat low torque valves to high required torque, due to stiff valves. Manufactured from stainless steel this patented drive provides a very user friendly mechanism to close off the gas valves which is simple for the operator to remove and engage. 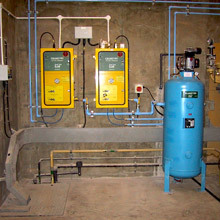 The ChlorGuard system is pneumatically operated and as such requires a bespoke compressor and receiver assembly to drive the system upon activation. For redundancy, the receivers are sized with enough capacity for 2 enclosures should the compressor fail. 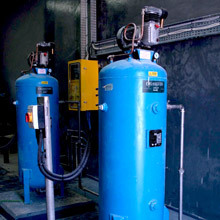 The compressors specified are very low maintenance, being oil free, and will provide many years of reliable operation. 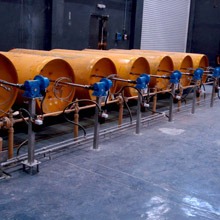 For many years, the bespoke ChlorGuard control panel provides a robust philosophy for valve shutdown while also offering feedback signals so that the end user can monitor the status of the system. 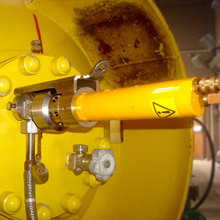 Process functionality has also been built in to assist the end user with activities such as closing the gas valves of an empty vessel before replacing. This compact drive solutions offers a niche solution for both cylinder and drum closure by providing a closing torque of up to 68Nm (50Ft/lbs) for the high torque requirements. These drive units are very light and easy for the end user to manoeuvre on or off the valve for ease of use.